I take a multifaceted approach to my art by exploring the world around me in a variety of media, including watercolor, graphite, fiber arts and acrylic. Since my creative processes are energized when I feel a personal connection with by subject, my artwork usually portrays people I know or places I have been. As I find the interplay of light and color to be especially exciting, I incorporate both of these conditions in my paintings. Watercolor is presently my favorite medium, as the transparency of the paint allows for some extremely luminous effects on the paper. I may strive for realism in my artwork, or move to a somewhat more abstract or illustrative style, depending on the subject chosen and the mood. I hope, through my works, to portray how I feel about the scene in front of me; to show it as I saw it, touched it, smelled it, while simultaneously giving the viewers a chance to relive their own similar experiences. 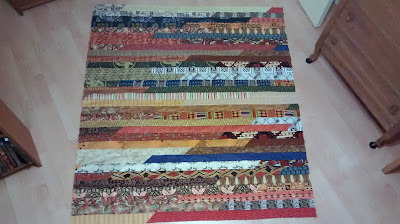 One evening last week, I spent an hour and a half doing the next steps in creating the quilt top, according to the jelly-roll race instructions (fold, sew, cut... repeat). The result was more square than rectangular, probably due to the fact that I joined the strips on the diagonal, rather than using straight seams, thus slightly decreasing the overall length of the long strip. 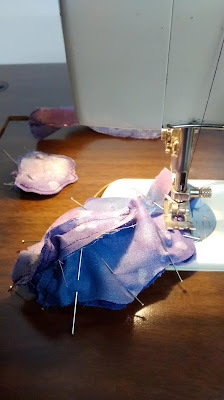 The fabric piece (for a new piece, it was) then sat on my sewing machine while the rest of the week passed and I mulled over my options in my head. Well, that was a very busy week, or so it seemed. Between making music (I think I can say I've got five fiddle tunes solidly under control), doing the occasional drawing and keeping on top of the day-to-day activities, the week just flew by. I did find time during the week to cut out the doll pieces I sewed last weekend, and made some time today to sew some of those together, as required. The head, for instance, is sewn in two stages, as is the body. As I was sewing the head pieces together, and defining the toes with stitches, I was reminded once again how fiddly those things are to do when the doll is small, like this one will be. I just hope I can turn everything right-side-out without pulling the seams apart. The tiny seam allowances which allow the pieces to be turned without bulk and without clipping are very susceptible to breaking open under tension. I made good use of some Fray Stop and will hope for the best. My website has been re-built and is now up and running. No more coding for me, for now! I'm hoping the drag-and-drop method will be more enticing (and easier) to refresh on a regular basis. 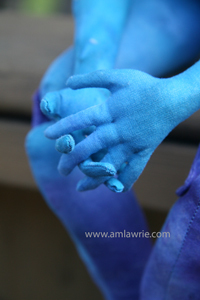 You can visit me at www.amlawrie.com.